The L.A. underground Hip Hop scene boasts an impressive and original list of talents who have graduated from the streets to the studio. However, the competition is fierce, more so with rivalries between crews and venues. But still the city's flame attracts scores of artists and producers every year, each wanting to score a piece of Hollywood for themselves, unwittingly bringing them into direct contention with the native West Coast talent. One LA resident who knows first hand is Regan Farquhar. Under the alias of Busdriver, Farquhar creates progressive, open-minded and sometimes challenging Hip Hop. It's 6am in L.A. when Farquhar gets a call from London. Bolstered by coffee, he's perfectly chatty and prepared for a grilling on his career and new album, "Fear Of A Black Tangent". "At nine I started rapping at school and at thirteen I had my first group", he reminisces. "I just kept going from there. Rapping was always my focus". Despite the early start, it was only a couple of years ago when he realized that his passion for Hip Hop could one day pay off: "I'd never really formulated the idea of being a recording artist and putting out albums. I was just rapping and having fun". Farquhar's early days were played out in South Central L.A., at the renowned Good Life Café, a stomping ground for underground Hip Hop artists which nurtured the likes of Jurassic 5 and the Pharcyde. "Your association is really critical in how much people pay attention to you," he says, stating a cardinal rule of success. "It's quite competitive… the pressure is always about what crew you're down with". 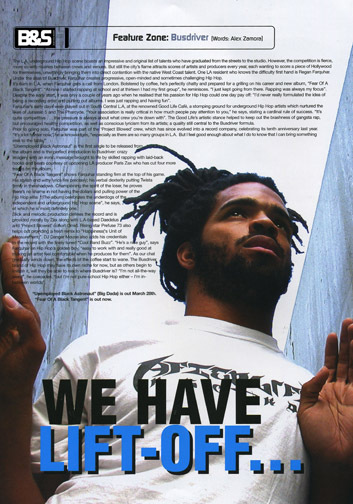 The Good Life's artistic stance helped to keep out the brashness of gangsta rap, but encouraged healthy competition, as well as conscious lyricism from its artists; a quality still central to the Busdriver formula. Prior to going solo, Farquhar was part of the 'Project Blowed' crew, which has since evolved into a record company, celebrating its tenth anniversary last year. It's a lot harder now," he acknowledges, "especially as there are so many groups in L.A. But I feel good enough about what I do to know that I can bring something else to the table." "Unemployed Black Astronaut" is the first single to be released from the album and is the perfect introduction to Busdriver: crazy imagery with an ironic message brought to life by skilled rapping with laid-back hooks and beats courtesy of upcoming LA producer Paris Zax who has cut four more tracks on the album. "Fear Of A Black Tangent" shows Farquhar standing firm at the top of his game. His stylish and witty lyrics fire precisely; his verbal dexterity putting Twista firmly in the shadows. Championing the spirit of the loser, he proves there's no shame in not having the dollars and pulling power of the Hip Hop elite, (The album) celebrates the underdogs of the independent and underground Hip Hop scene", he says, of which he is definitely one. Slick and melodic production defines the record and is provided mostly by Zax along with L.A.-based Daedelus and 'Project Blowed' cohort Omid. Rising star Prefuse 73 also helps out providing a fresh remix to "Happiness('s Unit if Measurement). DJ Danger Mouse also adds his credentials to the record with the finely tuned "Cool Band Buzz". "He's a nice guy", says Farquhar on Hip Hop's golden boy, "easy to work with and really good at making an artist feel comfortable when he produces for them". As our chat gradually winds down, the effects of the coffee start to wane. The Busdriver brand of Hip Hop may have its own niche for now, but as others begin to imitate it, will they be able to reach where Busdriver is? "I'm not all-the-way weird", he concedes, "but I'm not pure-school Hip Hop either - I'm in-between worlds".